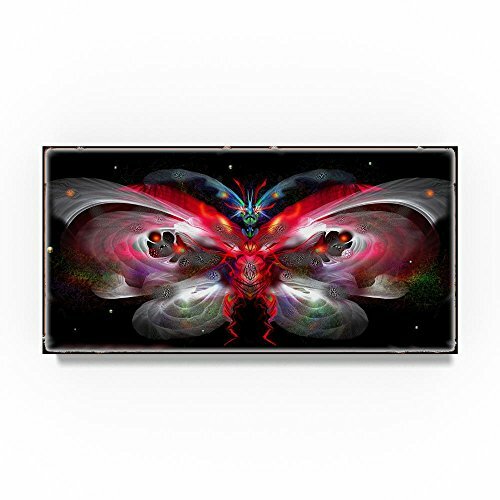 This ready to hang, gallery-wrapped art piece features a red butterfly shape in the center of the frame. Natalia Rudzina was born in Minsk to a family of musicians, studying in music school and graduating from the School of Fine Arts for children. She went on to study at the State Academy of Fine Arts Belarus, Minsk and thereafter, began work as an Art Director ,scenery and costumes, for the state television in Minsk. She also worked in theater, film, created costumes for Dance Revue Charaunizi, ballet, figure skating, choirs and State Ensemble of Volk Dance Belarus music groups. Giclee (jee-clay) is an advanced printmaking process for creating high quality fine art reproductions. The attainable excellence that Giclee printmaking affords makes the reproduction virtually indistinguishable from the original piece. The result is wide acceptance of Giclee by galleries, museums, and private collectors. Gallery wrap is a method of stretching an artist's canvas so that the canvas wraps around the sides and is secured a hidden, wooden frame. This method of stretching and preparing a canvas allows for a frameless presentation of the finished painting. If you have any questions about this product by Trademark Fine Art, contact us by completing and submitting the form below. If you are looking for a specif part number, please include it with your message.